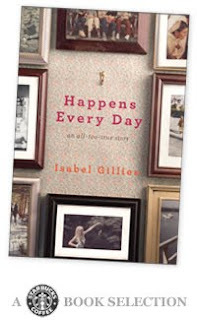 Happens Every Day By Isabel Gillies. Like watching a train wreck, this memoir is hard to put down. The reader knows what is coming, can feel it coming, knows how sad it will be, wants to warn Isabel! Isabel and Josiah have known each other all their lives. They come from similar waspy backgrounds. Both prestigious and educated, wealthy and elite. She is beautiful, talented and smart. He is romantic, poetic, warm and familiar. They fall in love, have two little boys and Josiah accepts a job in Ohio at a university. It is a big move. They easily melt into small town quaint life. They spend their time adjusting, renovating their small home, teaching and repeating how wonderful it will be be to raise their two boys in this beautiful enriching environment. Their relationship hits a bumpy road when Josiah and Isabel befriend a new teacher who is married but living alone in Ohio. It is the beginning of the end for Isabel as her life slowly disintegrates. This memoir can be viewed from many angles depending on your experiences, your fears and perhaps the present state of your marriage or singleness. Sadly Isabel is told by none other than the culprit, it happens every day.